Fresh off a European tour in support of their 19th studio album, NOW What? !, DEEP PURPLE is heading stateside for a North American trek. The tour kicks off August 4th in Scottsdale, AZ. Originally released in North America in April 2013 via earMusic / Eagle Rock Entertainment, NOW What?! marked the next great chapter in the band’s 40+ year career, blending the classic 70s DEEP PURPLE spirit with modern production and a progressive mindset. Having reached #1 in Germany, Russia, Czech Republic and Austria, charting Top 5 in 7 countries and Top 10 in 10 countries, not to mention hitting the British Top-20 for the first time in 20 years, DEEP PURPLE celebrated with the release of the NOW What?! Gold Edition earlier this year, which included additional songs and a live bonus disc. In anticipation of their return to North America, DEEP PURPLE will release their next single to radio, “All The Time In The World”. In October, Eagle Rock will release a new DEEP PURPLE DVD, Around The World Live, and they have uploaded a video for “Black Knight”, live at the NEC. You can check out the video right HERE. 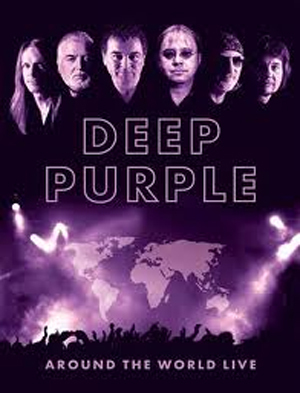 This set features three full DEEP PURPLE concerts, highlights of a fourth, interviews with the band members and a new documentary telling the full DEEP PURPLE story from their beginnings up to the present day with an emphasis on the Steve Morse era. The four full-length DVDs are packaged within a hardback cover that also contains a 32 page specially commissioned book written by Joel McIver and illustrated with photographs from the era covered by the concerts. The discs cover concerts in India, South Korea, Australia, and the UK across a seven year period.